Pelican 1 Owner, LLC, the developer for Mystique, announces that the seventh floor of the 20-story tower has been formed and poured, with additional floors underway. Pelican 1 Owner, LLC, the developer for Mystique, announces that the seventh floor of the 20-story tower has been formed and poured, with additional floors underway. Pelican 1 Owner, LLC, is an equal partnership between an affiliate of the global investment firm Kohlberg Kravis Roberts & Co. L.P. (KKR) and an affiliate of the Gulf Bay® Group of Companies (Gulf Bay). Construction at the ultra-luxury high-rise continues to progress as the pouring of the seventh floor is completed, with the eighth floor expected to be completed by the end of the month. In early February, installation of the exterior glass storefront and window systems and metal framing of interior partitions on the first residential floor (Jardin residences) is expected to begin. Upcoming milestones at Mystique also include the pouring of the ninth, 10th and 11th floors, which are expected to be completed by the end of February. Mystique’s Certificate of Occupancy is estimated to be achieved in March 2019. Located just steps from the beach on one of only two remaining zoned developable land parcels in Naples between The Ritz-Carlton on the beach and Port Royal, Mystique offers 68 estate and four penthouse residences with expansive living spaces and terrace views toward the Gulf of Mexico from most units. Additionally, Mystique offers nine Jardin residences. Estate residences at Mystique range in size from 4,003 to 5,280 square feet of air-conditioned living space and are priced from over $3 million to over $7 million. Jardin residences offer 1,370 to 2,396 air-conditioned square feet and range in price from $1.2 to $2.2 million. Mystique’s four expansive penthouse residences, priced from $8 million, have been sold. Founded in 1986, Gulf Bay has successfully completed 14 luxury properties along the 1.5 mile stretch of Gulf-front land within Pelican Bay. 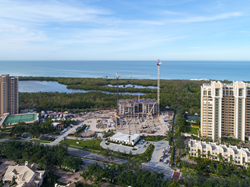 In addition to its history in Pelican Bay, Gulf Bay’s other award-winning developments include The Brittany on Park Shore Beach; Marco Beach Ocean Resort® on Marco Island; and the 4,000-acre award-winning, master-planned community of Fiddler’s Creek®. Gulf Bay’s completed and under development build-out market value of luxury residential properties is estimated in excess of $5 billion. For more information about Mystique, call 239-598-9900, stop by the sales center at 6885 Pelican Bay Blvd., Naples, Florida, or visit http://www.MystiquePelicanBay.com. Aubrey J. Ferrao is President of Gulf Bay Group of Companies.